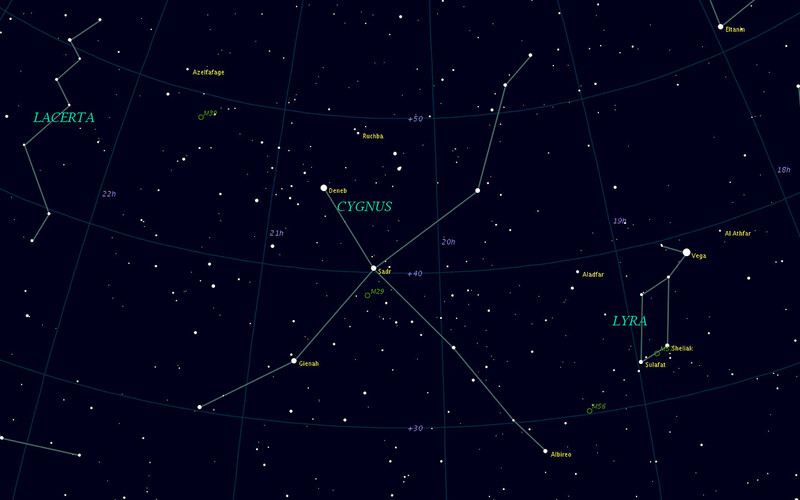 Cygnus is a notable summer constellation featuring numerous binocular binaries, including two showcase doubles. Several deep sky objects are also of some interest. Alpha Cygni, Deneb, is a bright (1.25) bluish-white supergiant 3000 light years away. The star represents the tail of the swan, and is the obvious starting point to the many interesting features of this constellation, as well as a convenient pointer to a number of other stars in the region. Deneb forms a large triangle, called the Summer Triangle, with Altair and Vega, in Lyra. Deneb has a few Flamsteed numbered stars as neighbours. Beta Cygni, Albireo, may not be the brightest star of the constellation but it's by far the most interesting. As a double star with striking colour contrast Albireo is a fine introduction to the study of binary stars. The primary is a deep yellow, often described as 'golden', and its companion is a bluish-green, or 'sapphire'. This 5th-mag companion is found at a Position Angle of 54� and a distance of 34", which makes it quite easy for smaller telescopes and binoculars. Albireo is just inside the Summer Triangle, midway between Vega and Altair. At this point, we're quite close to several other constellations. Once you've discovered the beauty of Albireo, you'll come back again and again to enjoy its remarkable colours. Omicron1 Cygni (also known as 30 and 31 Cygni) form a wonderful binocular binary with an interesting colour contrast, one of the finest systems in all the heavens. The orange primary is 31 Cygni and its turquoise component B (30 Cygni) is found at 338� and a wide separation of 338". Component C is slightly fainter, at 7.0, and is found at PA 173� and separation 107". The double is found between Deneb and delta Cygni and slightly to the north. Just to the north, in the same field, is 32 Cygni (omicron2); don't confuse this star as one of the binary components. 61 Cygni is an attractive binary of two dwarf orange stars. The primary is 5.2 visual magnitude, its component is 6.1. This component orbits the primary every 653.3 years. 61 Cygni has the distinction of being the first to have its parallax measured (in 1838). The system is about one and a half binocular fields southeast of Deneb, accompanied by three brighter stars.